SCVHistory.com HB1701 | Film-Arts | Stephen Chase, Western Actor (1902-1982). Western character actor Stephen Chase is seen here in the 1939 Tom McCoy vehicle, "Code of the Cactus." Chase appeared in numerous motion pictures and television episodes that were filmed in the Santa Clarita Valley. At 6-foot-3, he was the only non-little person to appear on screen in the 1938 Western musical drama, "The Terror of Tiny Town" (filmed at Ernie Hickson's Monogram Ranch in Placerita Canyon) — he was the announcer on the stage at the beginning of the picture. Stephen Chase (1902-1982) was an actor appearing in many movies and television shows. His tall, 6'3" stature and his ability to ride a horse made him an ideal candidate to appear in Westerns. He often played the villain and was usually the leader of the dubious gang. IMDB.com lists him with 98 movies (26 westerns) and 47 television show (17 westerns), appearing in 77 episodes (31 westerns). 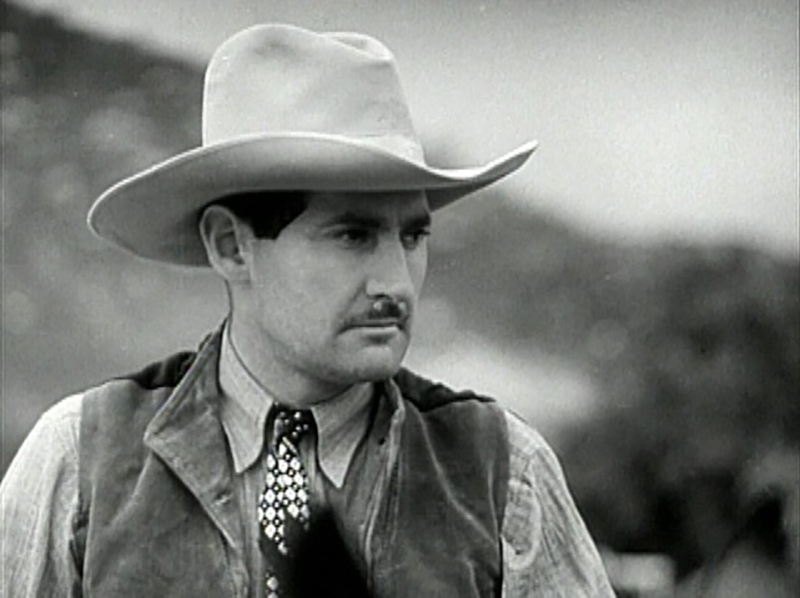 His western movie credits include 6 movies with Tim McCoy, as well as "Under the Western Stars" and "North of the Great Divide" with Roy Rogers. One of Stephen Chase's larger parts was in "Belle Le Grand," playing Montgomery Crane. His television credits include "Bonanza," "Death Valley Days," "The Rifleman," "The Cisco Kid," "Maverick," "Gunsmoke," "The Lone Ranger" and "The Roy Rogers Show." Included in his credits is a movie featured on SCV in the Movies, "The Terror of Tiny Town." In this film, he played the announcer and was the only actor appearing in the movie who was not a little person. His best-known movie is the 1958 sci-fi cult thriller, "The Blob," where he plays Dr. T. Hallen. Many of his works were filmed in the Santa Clarita Valley. Born Guy Alden Chase on April 11, 1902, in Huntington, Long Island, Stephen Chase got his start in acting by playing the leading lady in a play performed by his all boys' school. In addition to his film and television credits, he was also a vaudeville performer and Broadway actor, and he appeared on many radio shows. He died April 1, 1982, in Santa Monica. Although he did not live in the Santa Clarita Valley, his children, grandchildren and great-grandchildren do and/or did live in Newhall, Valencia, Stevenson Ranch and Canyon Country. HB1701: 9600 dpi jpeg courtesy of Ken Chase, his son.